The American Society for Laser Medicine and Surgery (ASLMS) recently met in Dallas for its annual meeting. This Society was founded in 1981 and our own Dr. Kenneth Arndt was one of the founding members. The organization is a multi-specialty organization devoted to research, education and advancement of the field of lasers and all types of energy based devices. When the Society was established there were only two lasers available for clinical use, the continuous wave argon laser and the continuous wave carbon dioxide laser. As time has evolved however, multiple other devices and treatments have become available using different types of energy, such as radiofrequency, microwave, ultrasound, and devices using various forms of thermal energy such as targeted heat and cold. Physicians from SkinCare Physicians have been integrally involved with the Society as it has evolved. Dr. Arndt was President of ASLMS in 1987, Dr. Dover was President in 2013, and Dr. Rohrer is currently the Vice-President and will ascend to the Presidency in the near future. 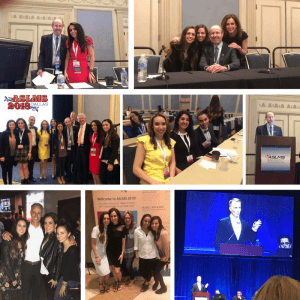 Many SkinCare Physicians staff and fellows have contributed to the Society in the past and currently by serving in their administration, chairing committees, acting as journal editors, organizing the annual meeting, chairing sessions and presenting research. It was wonderful seeing many colleagues and particularly many of our previous fellows who attended this year’s meeting to contribute to the Program and be involved in their educational activities. In attendance were 15 of the approximately 50 fellows, whom we have trained since SkinCare Physicians was established almost two decades ago.